Guarda, 9, 10 & July 11, 2010: The 2010 Convention of ETSGA was organised in Portugal, at Guarda, a historical centre to the Northeast of the country. Friday 9: the 1st ITSGA world conference has been organised with the participation of the presidents of the Algerian, Mexican and Brazilian federations (Photo). In the evening a conference on the theme of the TSG development took place at the Polytechnic Institute (Photos). 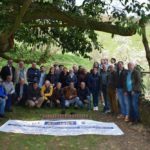 Saturday morning it was the AGM (Photo), then the festival of traditional games (Photos) and the receipts (Photo) with the promoters of the 2011 AGM in Le Gers, France (Photo). 12, 13 & 14 March, 2010: The city of Zaragoza, Aragon, Spain, received the ETSGA Council to the invitation of the FADT (Federacion Aragonesa de Deportes Tradicionales), member of the ETSGA. Friday 12 a visit was organised to the Palace of the Cortèses (photo) in Aragon (Castle of Aljafería), then a reception to the Town hall of Zaragoza (photo), and finally the inauguration of the great traditional games exhibition of Fernando Maestro (photos). 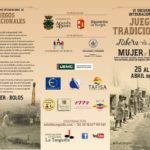 Saturday was dedicated to the agenda of the Council, and Sunday to a visit to the city of Catalayud that organised a championship of “Tiro de Barra” photos. 10th, 11th & 12th of July, 2009: The 2009 Convention of Aranda de Duero, to the north of Madrid in Spain, was a great moment of emotion for the people in charge of the traditional games. On Friday (photo 1) a historical conference was organised on the theme of the connection between traditional games and social health, regrouping 180 delegates and experts. The contributions of professors Parlebas (president of the scientific committee – photo 2), Eichberg (Denmark), Lavega (Spain), Gomaratut (Thailand), Lee (Korea), Martin Nicolas (Spain) and Magno Ribas (Brazil) were very appreciated. They will be published in a book of acts. Several didactic workshops were organised in the afternoon (photo 3) as well as practical sessions, organised by experts, as for the women skittles (photo 4), and a visit to the Palace of Penarañda (photo 5). Saturday was organised the elective AGM, with the reception (photo 6) and other meetings (photo 7), a festival with numerous demonstrations (photo 8: Tiro of bola aragonesa). Sunday was reserved to a national championship of calva (photo 9; photo 10), a wine-making cellar visit (photo 11) and Leonese wrestling for the volunteers (photo 12). 6th and 7th of June 2009: The 2nd traditional sports festival of Sète (photo 1), South of France, was organised in parallel of the international symposium “Latinity, the Mediterranean and cultural globalisation”. The regional sports were presents: the tambourine (photo 2, photo 3) ; the sea oar (photo 4); the skittles of eight (photo 5); the jousts (photo 6, photo 7, photo 8). 23rd to 26th April 2009: The 2009 championship of Celtic wrestling was organised in Scotland, in the south of Glasgow, at East Kilbride. Nine federations had registered teams and it is the Canarians that have won for the men, and the Leoneses for the girls. Photo 1 – Team of Scotland, Salzburg, Iceland and Sardinia. Photo 2 – Image of a contest. Photo 3 – After a contest. Photo 4– The trophies ceremony. Photo 5 – The Leoneses team. Photo 6 – The Canarian team. Photo 7 – The Canarian delegation. February 27 to March 1st: The Congress “Pic i Pala” (Kit-Cat family of games) has been organised near Valencia (Spain) with the participation of many delegations: Photo 1, one of the delegations:Photo 2: opening of the Congress. Different modalities of the family game were presented : Photo 3 & Photo 4, Bòlit Anglesola; Photo 5, children competition; Photo 6, modality for distance; Photo 7, Lippa from Italy. An exhibition was proposed to the public; Photo 8. January 16-20, 2009: The UNESCO organised in Tehran (Photo1, Photo2), in co-operation with the organisation for the Physical Education of Iran whose president is the Iranian vice-president (Photo3), a collective consultation on the promotion of the traditional sports and games in the world. The meeting gathered 22 experts, came from all continents (Photo4, Photo5,Photo6, Photo7) that adopted a common definition for the traditional games. This meeting had also for objective the setting up of a UNESCO consultative Committee, knowledge platform of exchange, in order to advice the UNESCO official structures in their decisions. Personalities have been nominated: Group I (West Europe) Pere Lavega and Pierre Parlebas; Group II (East Europe) Wojciech Liponski and……; Group III (America) Alida Zurita (Mexico) and Oscar Incarbone (Argentina); Group IV (Asia) Jong-Young Lee (Korea) and Chuchai Gomararut (Thailand); Group Va (South Africa and Oceania) Malam Barka AKODA (Niger) and……. ; Group Vb (North Africa – Arabia) Ezzeddine Bouzid and……. Workshops showing different Iranian traditions were proposed (Photo8, Photo9,(Photo10). Kamal Guemmar – Algeria, president of the CIGEPS (Inter Governmental Committee for Physical education and Sport) presented the executive committee of the new committee: Rif Gainanov – Federation of Russia; Mohammad Hadi Hesam – Islamic Republic of Iran; Khalil Ahmed Khan – Pakistan (Photo11). 22 – 25 of November, 2008: The Autochthonous and Traditional National Games and Sports Federation of Mexico and its president, professor Álida Zurita Bocanegra, received a representative of ETSGA for its XI National gathering, coinciding with the 20th birthday of the federation creation (Photo 1, Photo 2, Photo 3). Fernando Maestro represented the ETSGA at the time of the conferences, festivals, and meetings. The delegates of the different territories (Tabasco, Veracruz, Michoacán, Chiapas, Yucatan, Chihuahua, Sinaloa, Guerrero, Tzinacantan, Queretaro, Quintana Roó, Tlaxcala, Nueva Léon, Campeche) have demonstrated their games (Photo 4, Photo 5, Photo 6) of which the famous game of Ulama where the ball is hit with the hip (Photo 7, Photo 8) , or the mythical and nocturnal game of la pelota purépecha – the flaming ball (Photo 9). 24, 25 & 26 of October, 2008: The city of LLEIDA, Catalonia, welcomed the ETSGA council, to the invitation of INEF (national Institute of physical education), member of ETSGA. Friday 24 a small festival was organised in the centre of the city. Photo 1, Photo 2, Photo 3. The delegates has been received by the municipality of Lleida. Photo 4. After the meal a conference was organised at the palace of Culture, gathering 120 physical education students and professors. Photo 5. In the evening a visit was organised to a group of people training in human towers (Castellers). Photo 6. (On Sunday an exhibition was made in public. Photo 7) The council meeting took place on Saturday at the University. Sunday, the president was also at Aranda de Duero, with the leaders of the organisation “La Tanguilla”, to prepare the general meeting of July 2009. A meeting with the mayor and the main sponsors took place as well as a visit of the main sites that will be used, like the one of the lodging place, in the centre of a historic village. Photo 8. 26 – 28 September, 2008: The association Giochi Antichi (AGA) of Verona (Photo1) have organised the 6th edition of TOCATI festival, international festival of the games in the street (Photo2, Photo3), organised in the historic centre of the Verona city (Italy). In 2007 Croatia was the guest of honour (Photo4) and in 2008 Scotland (Photo5 and Photo6). AGA also presents every year the Italian games (Photo7) and in 2008 an academic conference was co organised with ETSGA (Photo8). 13, 14 & June 15, 2008: The Congress 2008 of PERUGIA, in Italy, was a great moment of intercultural meeting. The conference showed the diversity and the quality of the speakers: Photo1, Photo2. About thirty organisations were represented at the general meeting: Photo3. Three hundred delegates from three continents had made the trip to exchange ideas and knowledge during three days. When the language of the words was difficult, it is the language of the body, in fact the one of the games, that took place; at the time of the festival; competitions: Photo5 and Photo6 and during cultural visits, of which the one of Assise:Photo7 and Photo8. 1st to 12th of May, 2008: study trip in North Greece, East Bulgaria and Romania by Guy Jaouen and Petar Petrov, a Bulgarian ethnologist. The goal was to meet the actors and responsible of the events of traditional sports and games at the time of the spring saint days festivals. One of the finalities was to consider some collaborations in a near future. PHOTOS : Nigrita, Gre 1 – 5; Dulovo, Bulg 6 – 10. 18, 19 & April 20, 2008: First Mediterranean Meeting for the Games of the Heritage, with one international seminary, an exhibition and intercultural workshop of traditional games. This meeting, organised under the patronage of the ministry of culture, was also used to organised a meeting to coordinate a new dynamic for the whole North African. 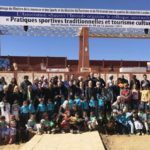 It was organised by the Ariana media library and the ATSSJP (Tunisian Association for the Safeguard of the Heritage Sports and Games), with for partner ETSGA. : Photo1, Photo2, Photo3, Photo4, Photo5, Photo6, Photo7. 24, 25, 26 & December 27, 2007: Journey of survey in Tunisia, with numerous meetings with leaders to develop the use of traditional games in the education, the tourism, the craft industry. Most of these meetings were held at the time of the Douz festival, an oasis of the South Tunisian. Photo1, Photo2, Photo3, Photo4, Photo5, Photo6, Photo7. 5, 6 & 7 October 2007 – council meeting in Lama Mocogno (Italy) to the invitation of the FIGeST, the Provincial FIGeST Committee of Modena, the A.S.D.R of Lama Mocogno and the A.S.D.R. of Tolè 2000. Visit of a local dairy: : Photo1, Photo2 , Photo3 and Photo4; council meeting: Photo5; games and cheese festival: Photos; championship of throwing the cheeses (1, 3, 6, 33kg): Photos; the game of mora: Photo11. 5, 6, 7, July 8, 2007 – Assembly General Meeting of Angers: Receiption to the town hall of Angers: Photos. Initiation to the boule of Fort in a society: Photo3. International conference: Photos. Reception to the Departement Council: Photo6. Visit of a cellar of Saumur Champigny: Photo7. General meeting: Photo. Exhibition in Mazé: Photos. Folk evening: Photo11. 10 & 11 march 2007: Meeting of the council in Valencia (Spain) on the invitation of the Escola autonòmica de jocs tradicionals» and the «Fundació (fondation) Jaume II El Just». The meeting saw the signature of an agreement of partnership with the « High Institute of the Childhood Officers of Carthage» (Tunisia) – Photo. The european council members have also been invited by the municipality of Burjassot and to exhibitions & competitions of skittles – Photo. The visit to the townhall of Valencia during the Valencia festival created fortuitous meetings – Photo. From February the 18th to the 24th was organised in Carhaix, Brittany, an international camp of young people practising traditional wrestling in their country. A seniors Scottish wrestling competition has marked the end of the week. This wrestling style is indeed quite close to other styles, like the one practised in Sardinia, in the Spanish Léon, in England, etc. The wrestlers swear to wrestle with loyalty (photo) before wrestling. The oath is pronounced in the languages of all the regions, and for the 1st times in one of the tong of Niger (photo). The position of the arms is locked in Scottish wrestling (photo), which doesn’t avoid spectacular throws (photo). 192 people participated to the symposium (with representatives from 12 universities) (photo). 70 different games have been demonstrated during the festival (43 skittles games). The president of the organising committee Fernando Diestro receives a present from the secretary of the Confederation Falsab – France (photo) (The president of the scientific committee, Pere Lavega, is on the right with Pierre Parlebas, professor in La Sorbonne). From the 10th to the 13rd of August: Assembly General Meeting to Rodez (Midi-Pyrenees, France) during the finals of the France championship by teams of skittles of eight (the 10.08) and the France individual championship (13.08). The delegates have been received by the vice presidents of the general council of Aveyron, and by the municipalities of Espalion and Rodez (11.08). June 24th to July 10th, 2006: Journey of survey in the South East of Europe. Photographies : tournaments of Sohos in Greece June 29th and 30th 2006, and Kirpinar in Turkey, July 1st and 2. March 13, 2006: Meeting in Paris to the head quarters of UNESCO (United Nations Educational, Scientific and Cultural organisation), with the object to prepare the creation of an international platform whose goal will be to promote and develop the traditional games and sports in the world. Conference on Sunday March 12 (photo), with the participation of the president of ETSGA, the one of the FIGEST president, the mayor Livio Scattolini, the European deputy Luciana Sbarbati, the Vice president of the Marche region, the president of the CONI, Vittorio Ferrero from the CONI, Jean Fulcrand, Pere Lavega (photo), Erik of Vroede and Fortunato Giovannoni from the Figest. March 8, 2006 (evening): Meeting of Brissogne (Valley of Aoste), in the PALAFENT, heat office of the FENT, with the president of ETSGA, the responsibles of the FENT and those of the street festival of Verona (Italy). (photo). March 8, 2006 (morning) – Meeting to the head office of FILA, at Corsier sur Vevey (Switzerland) for the signature of a partnership convention between Willie Baxter, president of the FILC (International Federation of Celtic Wrestling), and Raphael Martinetti, the one of FILA (Federation Internationale des Luttes Associées) – (photo).